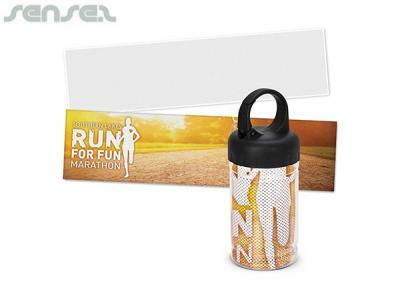 Print your logo onto these custom printed full colour cooling towels in canisters or one of our other innovative cooling towels and use them in your next marketing campaign as a unique giveaway item. Incredible towel which is manufactured from a 50/50 blend of nylon and polyester. Premium cooling towels have 50% nylon content and will cool faster than similar products made from 100% polyester or Dacron. Nylon fibres completely repel water which evaporates much faster when it contacts them. It will cool up to 15 degrees below the outdoor temperature in seconds by harnessing the power of this rapid evaporation. To activate it, simply wet the towel, wring it out and snap it tight to remove excess water. It is worn around the neck or head and natural, chemical free cooling will last as long as the towel remains wet. Great for playing sports, jogging, walking, biking, at the gym, working outdoors etc. Pad Print: Tube: 25mm x 40mm on the tube printing an extra $0.60c per item. Screen Print: Tube: 80mm x 60mm. Sublimation Print: Towel: 800 x 300mm (plus bleed if required). Prices shown includes Full Colour print, on the Towel. Custom brand these frosty towels in pouch or one of our best-selling promotional towels»cooling towels with your company logo! Your promotional full colour cooling towels in canisters can be silk screen printed in 1 or more colours. Costs shown include a 1 colour logo print on your custom branded full colour cooling towels in canisters. We can print more than 1 colour, however it incurs extra costs. We can achieve a perfect PMS colour match for the print. Personalise your full colour cooling towels in canisters or custom design cooling towels for your marketing campaign. How can these unique promotional full colour cooling towels in canisters or our personalised cooling towels fit in with your marketing strategy and help you maximise your brand exposure? Our custom made Full Colour Cooling Towels In Canisters can be produced from a minimum quantity of 50 pieces. We can have your logo branded on these corporate Full Colour Cooling Towels In Canisters. A setup fee of AU$180.00 will apply to make the film.